I know I’m supposed to be getting ready for hunting season, but the weather has been so nice I can’t stay off the golf coarse. I have not been on this little par three with grandson Kyle since last year, when he was four. 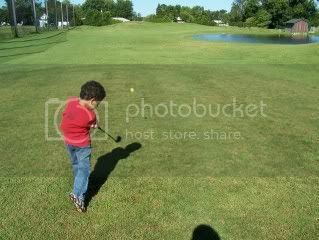 We have been to the driving range several times, but he’s been hesitant to actually play the course. The other day he said he wanted to go, as he got a new set of clubs a few months ago, and he was itching to try them out. As you can see from the picture, this kid is a natural! I really don’t see anything glaringly wrong with his swing. 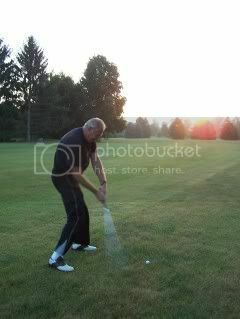 In fact if any of you seasoned golfers have any constructive criticism pass it along. I’m no pro, but this little 5 year old looks pretty smooth to me. He hit this drive over the hill a little left of the green. It went 100 yards and he bogeyed the hole. He shot a 53 for 9 holes using the women’ s tee’s. If he had half a putting game (his weak point) he would be easily in the 40’s, which is pretty remarkable for a 5 year old. He played the whole game using his hybrid club, and left his driver in the bag. Last year he had a 57, which was his low score till Thursday. I hope to get one more round in with Kyle before kindergarten starts, as he’ll probably be beating me by 2nd. grade. This is my older brother Randy. His real name is Norman Randall Ansel, but mom never wanted a Jr. so he was called Randy from the get – go. (My dads name was Norman.) We have been playing some golf over the past few weeks, and Randy is excited about his improving golf game. He is about to smack one up on the green and win another one of my “good” golf balls. I’ve been playing about 5 years now with my friend Ed Ponzy and am between a 14-18 handicap, depending on whom I’m playing. Right now Brother Randy shoots high 90’s and low 100’s, and he should be “fodder” for my r-7 driver. If only it were true! You see good old Randy (first born of 6 brothers) has is PHD in physiological warfare. After all he is a Marine combat veteran. No one on earth can get into my head like “big brother!” His constant chatter, banter, teasing, and little “side bets” can make a basket case out of my golf game. Case in point: Last week I spotted him five strokes (slam dunk) as we played for a dozen Pro-v1 golf balls. These are the best golf balls Titlist makes, and I was putting them in my bag before we hit the first tee. Well the King of Head Games had my number that day, and had me so frustrated I was “throwing” golf clubs further than I hit the ball! To make a long story short he beat me heads up, without a spot, as I recorded my first game in the hundred’s in over four years. 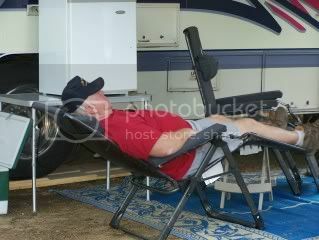 (106) Now for a guy that’s been in the 70’s a few times this is embarrassing as well as humiliating and expensive. Besides the balls, I’ve had to buy breakfast, as well as lighten my wallet somewhat. Not serious money, but enough to dent a mans pride for sure. Today I won the numbers game, but still shot a terrible round of golf. Randy had two holes that put the “whammy” on his score or it would of been a lot closer game. To say he had me spitting and sputtering would be an understatement. The man is good at what he does. He should of been a brain surgeon the way he gets in your head all the time. Seriously though I want him to improve his game, but as his brother I don’t really want him beating me, so I need to toughen up Bucko. I may have to see a “golf shrink” (Not) so I can handle the pressure. Brothers are a competitive bunch of male testosterone jocks when we play our little games aren’t we? Love ya Rand. This is one of the side benefits of bear hunting in the Upper Peninsula. 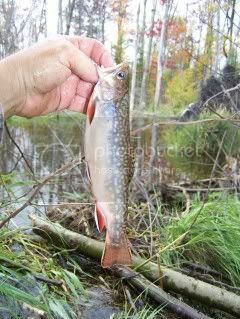 Now I know it’s not a monster brook trout, but it is decent size for a beaver dam brookie. Most of these fish are regulated to these back woods beaver ponds for their whole lives. That is unless I can entice one to hit my small spinner or fly. Trust me there is no better dinner than brook trout, baked potatoes, corn, and a salad. These little fish are almost all delicious tasting meat, and it just peels off the backbone/ribs once fried. Bear hunting is fun, but most mornings we have several hours to sneak up on an unsuspecting “brookie hole!” I say sneak up, as you literally do have to use some stealth if you want to put some in your creel. Brookies are very sensitive to movement (such as the ground) and will dash for cover if they see you. Most good producing holes are in the heaviest cover, and try a guys patience. I couldn’t tell you how many lines I’ve tangled trying to place my offering in the right direction. Chuck’s Finger Licken Good Chicken – Almost! This is our new camping buddy Chuck Smiley heading for his favorite lounge chair. There is only one thing wrong with this picture tho! Have you ever heard the saying “Where there’s smoke, there’s fire?” Chuck has some chicken on the grill that he and his wife Jan are preparing for our evening dinner together. My wife had made sloppy Joe’s along with a macaroni salad, chips, and baked beans. Jan also had some great sweet and sour cucumbers, and a pasta salad to go with the chicken. When I asked them to pass me the chicken, Jan said I eat it at my own risk. It was under a cover (to keep the flies at bay) and I hadn’t noticed the blacken chicken skin. I guess I should of known there could be a problem with “crispy” chicken when I snapped a picture of Chuck 10 second’s after he “hit” his favorite lounge. Jan came out of their motor home to check on all the smoke, in the neighborhood, but it seems she was to late to revive the poor chicken. Chuck’s son Scott is a firefighter, but he wasn’t around on this trip. You ever have one of those moments when you experience something or go somewhere, and feel you’ve been there before? Just last week I was talking with my mother, and asked her if she remembered the camping trip we took with one of my dads army buddies when I was about 8 or 9 years old. She remembered the trip, but neither of us could recall where it was at. 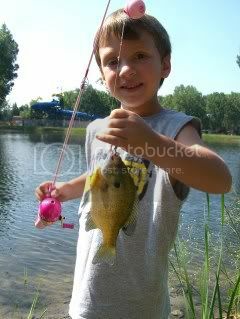 I remember fishing, catching turtles, and having a big ball game in a park. My dad hit one clear into the trees for a home run. Man he hit that ball 450 feet! I also remember sleeping in a army surplus tent with straw spread on the floor, and cooking our meals on a Coleman stove. That would of been 55 summers ago. Well this past week we did some camping in Allen Michigan. My grandson Kyle wanted to play putt-putt golf, so we had to go into Hillsdale to do that. We played in the heat and humidity and were tired and hungry when we got done. Tara (our daughter) made some sandwiches, but we needed to find a shady spot to eat them. While driving around downtown Hillsdale we saw a sign directing us to a park. The above picture is at the entrance (at least one of them) to Baw Beese Lake park. 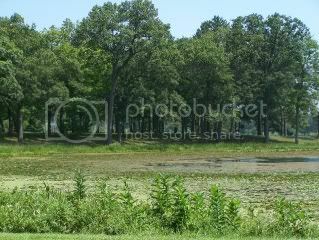 It is the exact area where we played our ballgame many years ago, and where my brothers and I fished and caught turtles. The ballfield was now grown up with mature maples, and as I remeasured the blast my dad hit it was probably more like 200 feet rather than 450! Hey I was a kid and it looked like a long way to me. We drove through the park, which now does not allow camping, and I reminisced about our family trip over half a century ago. Now I have a name to add to the picture I’ve always had in my mind about my first camping experience. Recently my wife and I were blessed to have all the grand-kids in one place, at one time. Not only that my wife’s parents were also on hand, thus the photo opportunity. 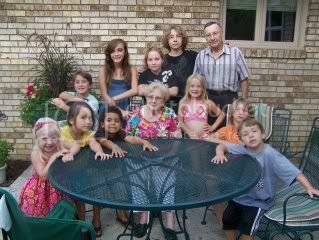 Great grandma Kay and great grandpa Leo are surrounded by great grandchildren from 3 years to 16 years old. As the photographer it took all I had to get a half way decent picture. Actually I took almost ten photo’s before I figured this one would have to do. My batteries were going dead due to all the “re-takes” of ten kids saying “cheese. We hope to take daughter Tara and grandson Kyle (third from left front row) camping at Marble Springs in Allen Mi. sometime soon. 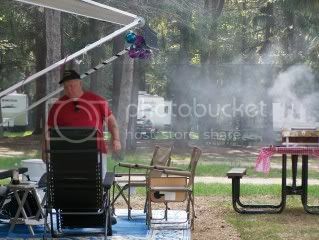 We still have a few grand-kids that we wanted to take camping before summer’s over. It’s hard to believe that September is knocking at our door. I’ll be bear hunting in about 6 more weeks, and I’m looking forward to the time in the Upper Peninsula. I went to apply for a private land doe permit today, and found out I can buy them over the counter on Sept. 10th. In fact it looks like I can buy 5 (doe permits) a day with no limit for the season. I find that hard to believe, but that’s the way I read it. Anyone have any input on that? Seems like that could put a real serious dent in the Southern Michigan deer herd, but it should also fill my freezer with tasty venison! To those readers, who may wonder, we were doing marshmallows and not “hot dogs!” We spent a few days camping with my niece Jody, her husband Scott, and their two kids MacKaylee, and Caleb. Scott’s mom and dad were also there (Chuck and Jan) along with two of their grand-kids Cody and Gracy. We had Jacob and Nina with us, and daughter Alena and grandson Quinn visited for the day. The first evening we had the bon-fire at our camp site, and the next evening it was at Chuck and Jan’s. We did smores both nights and shot the breeze around a roaring campfire. Scott is a fireman, but has a hard time starting a fire. We had to call in my grandson Quinn to bail Scott out of a fire- less situation. We think that subconsciously Scott doesn’t really “want” to start a fire, cause he’s supposed to put them out-not start them! Both Jacob and Caleb caught some really nice fish from the 5 acre pond on the property. We swam, did the water slide, rode bikes, played games, ate meals together, and just hung out together. It was a real treat getting to know Chuck and Jan a little better. 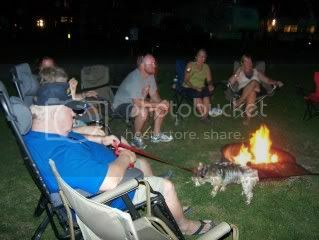 What good people we had to share our campfire with. Six grandkids down and four to go. Don’t know if we’ll make it or not, but were planning another trip for this upcoming week over in Allen Mi. We’ll take daughter Tara and grandson Kyle on that excursion. I had some problems with getting a real sulfur smell from my water system and Scott and Chuck figured it out for me. We drained my hot water tank, as Chuck made a makeshift funnel for the water to drain into. Much to my surprise Jan gave me a p.v.c. funnel in church this morning that Chuck had made for me. Thanks Chuck we appreciate everything, and look forward to spending more time with you both. 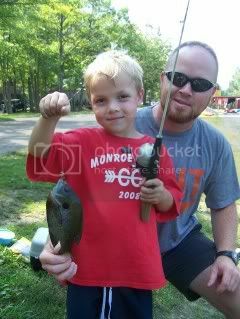 Jacob and his nice sunfish and Caleb and dad Scott with his monster bluegill. It’s not very often that I have my six kids and 10 grandchildren all together at one time. Well Sunday was a big occasion for us, as we celebrated my oldest grandchild’s birthday. Quinn Anthony Russo turned 16 years old (actually today) and we just had to give him a nice party. Also my wife’s parents Leo and Kay Boylan were able to make it, so we took several pictures of them together. One of the reasons we had to take several is because it is extremely hard to get 12 subjects to say cheese at the same time. There always seems to be at least one “clown” in the group, and we have at least “three” who could join the circus. We had a great day, weather wise, and were able to make good use of the pool, hit golf balls, ride 4-wheelers, jump on the trampoline, eat real Italian spaghetti, and relax (sort off!) When it got dark enough we lite a bon-fire, and Quinn and Micah (my son) put on a fireworks display that had us cheering for more. I mean they lite up the sky with “bombs bursting in air” like I’ve never seen, in someones back yard. It was totally awesome, just like my grandson Quinn. What a blessing he has been to my wife and me, along with the whole family. Micah is 27 years old, but he and Quinn have always had a special relationship. Their on the same page with music, computers, and personality. You don’t find many 16 year olds that play sports, maintain a 4.0 grade point, are musically and artistically inclined, and genuinely like their family. That’s cool Quinn, cause we all like (love) you too. Happy Birthday buddy. Hope you had a great day with your friends. Love ya Papa.